Thinning occurs naturally in all stages of stand development. Trees compete for a fixed amount of light, moisture and nutrients. Every stand or forest is capable of producing a fixed amount of plant or living matter. This is its carrying capacity. For individual trees to reach a large size there must be fewer of them. Every stand is different, but the rule never changes. Unmanaged forests or stands go through a series of stages where some trees die, which allows other trees to grow larger and live longer. There are many other changes occurring at the same time but most are not as noticeable as the changes in tree numbers, sizes and quality. Let's look at the stages an Acadian forest can go through. Old growth often precedes earlier stages of stand development. In 1869 the Saxby Gale blew over a large area of red spruce and eastern hemlock forest in southwestern Nova Scotia. The forest was made up of even-aged stands of trees with pockets of uneven-aged stands scattered throughout. Most trees in this particular stand were felled by the gale, approximately 200 per hectare in all. Weather conditions in the following year were drier than normal and a fire burnt quickly through the debris left from the gale. The result was a barren landscape with 10 to 15 centimetres of humus and organic material and large quantities of scorched stems and boles lying on the ground. Due to the blackened burnt duff layer, the surface temperature rose considerably. The fire burned through quickly, destroying seeds and soil flora and fauna in the upper organic layer. But the lower organic layer and upper soil were not damaged by the fire. Some shrubs like blueberry and witherod (wild raisin) that can withstand fast fires, re-sprouted. The wind-dispersed seeds of fireweed and aster also found their way to the site. These plants quickly took advantage of the full sun and nutrient rich site conditions. They held valuable nutrients on site in the form of annual leaf and litter fall. During this stage trees, like grey and white birch, balsam fir and cherries, also began to germinate. However, they were slower growing and didn't make up a visible part of the new forest at this stage. Fewer numbers of red spruce and hemlock were established as their seeds were consumed as fast as they were produced prior to the gale and fire by squirrels, mice and birds. After a few years, the early trees and high shrubs began to dominate the site. The shade produced by these larger plants caused the herbs and low shrubs to disappear. Their energy source, the sun, was taken away. But not before they secured their future in the seed bank and provided food for wildlife. Their stage is over, at least for now. Then the high shrub and early trees began to thrive. Shaded soil altered nutrient production by soil microorganisms to match the demands of the trees. Too many trees and shrubs are present on the site and the first natural thinning begins. Large numbers of white birch seed were blown on the old burn from an adjacent stand. At two metres high, there were too many. The balsam fir crowded between the fast growing white birch. Crowns occupied less than one square metre of space. This was fine when the trees were small but at two or three metres in height crowns could no longer produce enough foods to sustain the tree. Stem exclusion or thinning had begun. During this stage, the addition of new trees stops or is reduced to a few shade tolerant species. Individual trees with the slightest advantage of height, crown area and water, or nutrient availability begin to dominate. This can be a slow process, especially if there are 20 to 30 thousand trees per hectare. Hunters and hikers refer to this stage as a thicket. It's extremely difficult to walk through and it provides lots of cover for hares, deer and other wildlife in the understory. During the pole stage, very little light reaches the forest floor. This is also a period of rest for the understory. Leaf litter builds up, along with the stems and branches of trees that lose the race for dominance. Low light levels cause all the herbs to disappear from the understory. Even mosses have difficulty staying alive. This is most common in conifer thickets. However, in a thicket of white birch, light will penetrate in early spring and late fall and some mosses and lichens remain in the understory during the stem exclusion or thicket stage of a forest stand. Fungi are particularly well suited for this stage. They do not require sunlight and shade provides the moisture they need to flourish. The logs that were not consumed by the fire are waiting to be recycled by fungi into nutrients for the trees that survive the thicket stage. Thirty years later, the stem exclusion stage has ended. The white birch occupied the dominant canopy position. A few balsam fir remained as co-dominant trees and more have become established in the understory. Shade tolerant balsam fir will survive in the understory for many years. The stand now looked different. The 20,000 stems of white birch and balsam fir per hectare have been reduced to 1800. Growth rates have accelerated due to the reduced competition for nutrients, along with availability of sunlight to convert nutrients to food. The boles of the remaining trees grew rapidly and the dense shade of the thicket caused many lower limbs to fall or self prune. During the stem exclusion stage, the organic layer becomes better suited for the addition of new plants. Fungi begin to break down any large debris. This, coupled with lots of leaves and smaller debris, means that nutrients for herbs, shrubs and trees are in good supply. A much higher canopy with small openings created from crown damage by the swaying of trees in the wind now exists. This condition may persist throughout this stage of development. These small openings allow sunlight to penetrate to the forest floor. Shade tolerant herbs, shrubs and trees begin to establish themselves. Lady's slipper, witch hazel, red spruce and hemlock begin their cycles. The old stems left from the fire were now only moss-covered lumps lying throughout the stand. The salamander population had increased as the logs created small pools necessary for egg laying. White birch and balsam fir began to die, creating the necessary holes to provide eastern hemlock and red spruce with the light they need to take their place in the canopy. Much of the original debris left from the fire has been recycled by the white birch and balsam fir. As they die, they contributed organic matter that ensured that eastern hemlock and red spruce had sufficient nutrients to reach maturity. The stand now began to take on the characteristics of the original forest prior to the disturbances of wind and fire. Only scattered white birch and balsam fir remained. They had been replaced by longer-lived eastern hemlock and red spruce. Because small groups and single trees fell during the transition between the understory re-initiation and old growth stages, an all-aged forest developed. Low light conditions allowed shade tolerant eastern hemlock and red spruce to become established in the understory while they waited for an opening in the crown. Once a tree fell and created an opening, they were poised to grow and fill the space. These shade tolerant species do not grow as fast as white birch and must be established to out-compete such faster growing species. The ground was covered with mosses, some ferns and a few herbs. The mosses helped maintain high levels of moisture required for micro-organisms to break down leaves, boles and roots of the fallen trees. They also contributed moisture to the air, which helped maintain a high relative humidity in the understory. This is important for some organisms that inhabit a forest in an old growth stage. The white-footed mouse had been replaced by the red squirrel, which is thriving on the large amounts of seed being produced by the mature trees. No longer was there large amounts of browse for the white-tailed deer. Slow growing lichens appeared which are only found in forests that have not been disturbed for many years. Fungi thrive in the cool, moist understory of the old growth stand. Fungi have very wide spreading root systems that can transport nutrients from one area to another. This is helpful in the decomposition of large woody debris that is common in this forest stage. Exercise 1. Pick a spot on your woodlot. Describe the species, age, and density, and determine which stage it is at. The most important thing that trees and all green plants do is use the sun's energy to produce food. This is the process of combining hydrogen from water with carbon from carbon dioxide in the air. The result is a simple sugar or food for green plants. All organisms, including people, depend on green plants. Without them we would starve. By-products of this process include oxygen production as well as storage of atmospheric carbon, which are processes essential for life. In addition to simple sugars, trees require other nutrients for growth. Seventeen elements are essential to plant growth. Some, like potassium, are common in the weathered rock component of the soil while others, like nitrogen, make up a large proportion of our atmosphere. The best place to find all the nutrients for tree or plant growth is in the tree or plant itself. The nutrient cycle of the forest is another process essential to the existence and sustainability of the forest. This cycle occurs in all ecosystems: deserts, grasslands, tundra, including forests throughout the oceans of the world. Everywhere there is plant life, there is a nutrient cycle. When you walk through the Acadian forest you are walking on a layer of organic debris made up of leaf and branch litter, old tree boles, rotting fungi, herbs, and maybe even the decomposing carcass of an Eastern coyote. This organic layer is rich with nutrients. In fact, all the nutrients necessary for a healthy ecosystem are found in this thin layer. A healthy organic or debris layer is important for nutrient recycling. It is estimated that 80 percent of the feeder roots of most Acadian forest trees are found in the organic or debris layer. Thinning can affect the nutrient cycle and the organic layer. Species selection can also affect the availability of certain nutrients along with the rate of decomposition. These factors should be taken into consideration when thinning. 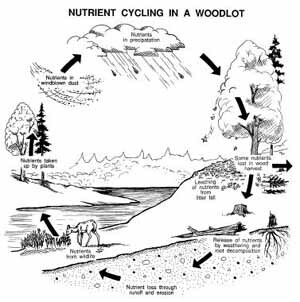 For more information on nutrient cycling and ecological processes, see Home Study Module 7, Woodlot Ecology.